Acorn squash is seasonal from September to December. This recipe is simple and economical. It would make a perfect appetizer served with a cheese and cracker platter for Thanksgiving! 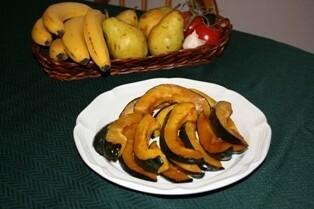 Preheat oven to 400 degrees F. Wash and dry the acorn squash, then cut in half, remove seeds and stringy core. Cut into thick slices. Squash has always been a holiday favorite, and Acorn or Butternut Squash are treated very much the same way. Full of flavor as well as being good for us makes it a great everyday choice too. Follow the same directions except cook in microwave for about 9 minutes...quick and easy.